Custom One of a Kind Desert Rose Model. The Original Owner had All 3 Bedrooms Professionally expanded and designed including Vaulted Ceilings. This unique home also features: Light & Spacious Great Rm w/Vaulted Ceiling; Kitchen has Upgraded Cabinets - Corian Counter Tops - Bay Window in Kitchen providing more space - Double Pantries; Large Master Bedroom; Guest Bath w/$12,000 Deluxe Therapy Tub (2018); New A/C (2015); Plantation Shutters in Guest Bedrooms; New Flooring in Great Rm & Hallway (2014) - Master Bdrm & Guest (2016); Upgraded Extended Covered Patio in Spacious Backyard. 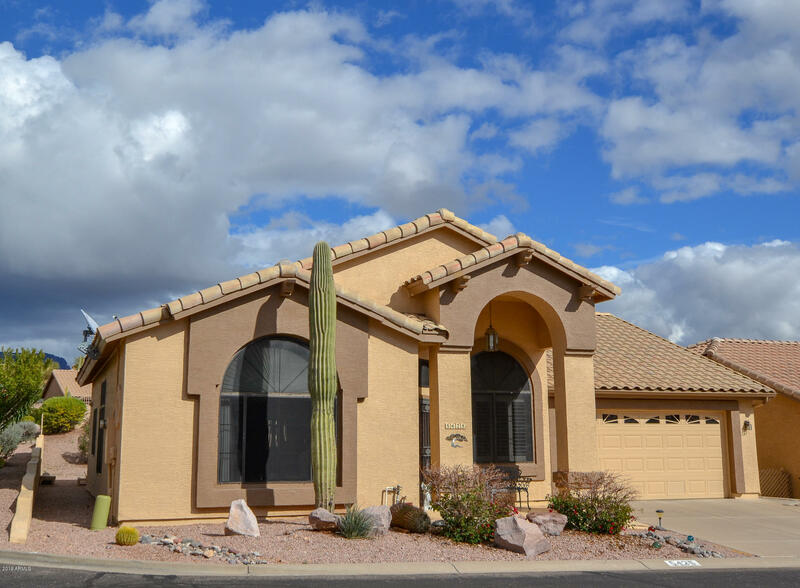 Make this Beautiful Home your own and Enjoy an active adult community with all the amenities nestled at the base of the Magnificent Superstition Mountains.